Makaila Carter returns as a senior leader and cornerstone for the 2017-18 Lady Tigers. 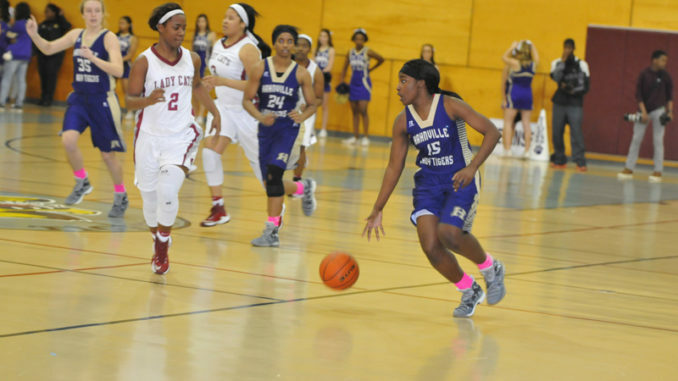 With a record of 4-3 in its first seven games, Hahnville is eying to make progress this season under second year head coach Arrianna Martin, though Martin is quick to note there’s a lot of work left to do. The Lady Tigers mix a group of experienced upperclassmen with a talented freshman class and as district play gets rolling this week, Martin said the team’s chemistry is coming along nicely. Seniors Makaila Carter and YaSah Gale are the team’s top returning starters from a year ago, while freshmen Kamryn Bartholomew and Kori Joseph have already made an impact in their first varsity season. The team is working through an injury to forward/center Paceley Williams, the team’s tallest player at 5-foot-8, and so far the Tigers’ quickness has been the advantage the team has leaned on to win games. Carter, the Tigers’ leading scorer last season, has been a strong leader for the team, notes Martin. The arrival of Bartholomew is one reason the team has been able to find a little more rest for Carter. The 5-fot-6 freshman guard is a player Martin said has generated excitement, and the coach believes she has a bright future ahead of her. This weekend, Hahnville is set to compete at the Walker High School tournament, which runs Friday and Saturday. Monday, the Tigers travel for district competition to face South Lafourche (5 p.m., JV/V), while next Wednesday the Tigers will host Terrebonne (5 p.m., JV/V). At the Central Lafourche tournament, Hahnville earned a decicive victory over E.D. White, 54-14. Carter scored 17 to lead Hahnville. Bartholomew added nine and Yelah Moses eight. In its tourney game against Morgan City, Hahnville captured a 55-31 win. Danae Lorio scored 12, Bartholomew 11 and Carter 10 to lead the Tigers.